I just know most men dream of getting inside a woman’s head (body? ), longing to understand the horrifying pain of menstrual cramps and the laborious duties of our monthly cycles. Good news, men. Now you can. It’s art. At the Royal College of Art’s graduate show in London, students showed off their creations, including an acoustic botanical garden and a “disc with legs” to keep electronics away from water. Hiromi Ozaki, however, developed the “Menstruation Machine”: a suit for men which releases blood stored in its reservoir over the course of a menstruation cycle, usually lasting about 5 days. It also has lower abdomen stimulating electrodes to mimic painful cramps. On a compassionate level, this is kind of cool. If you’ve never experienced the dreaded Cycle of Pain that comes with a monthly period, perhaps this will help people get a better understanding of why it’s impossible to function at work when you’re in a cold sweat willing yourself to die. I have friends who compare their period pains to those of labor contractions. That stuff is real. On the other hand, what the hell? Why would you put yourself through torture? Can you use a tampon with it? What kind of woman makes her loved ones experience such trauma? Is this the ultimate test to determine whether or not your boyfriend is fit for marriage? Also, where does the blood come from? Can you increase the flow? Why does this exist? Yes, I did just dedicate a whole post to menstruation. Have a great weekend. 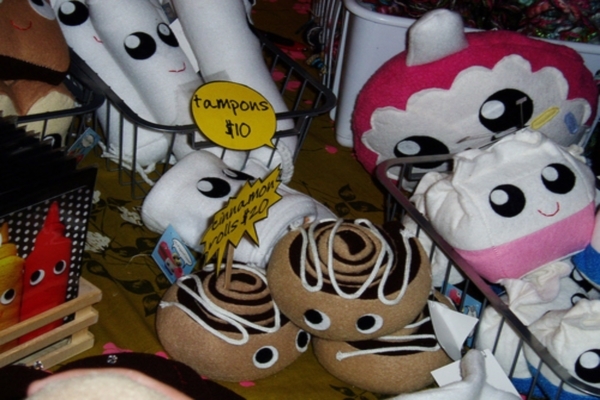 Men, do you fancy yourself a round of the Menstruation Machine? Women, would you giggle with glee? Share your thoughts.